Pattern Crazy: Mechanical Mayhem is the perfect adult coloring book for anyone who loves robots, steampunk, machines, technology, science fiction or patterns. With 45 pages to choose from, the variety in the level of detail between the coloring pages make this is a great coloring book for everyone – men, women, boys and girls. The lines are nice and thick so you can color extreme details without worrying about making mistakes. Pattern Crazy is a series of coloring books based on a variety of patterns created from hand-drawn art that has been digitally manipulated. 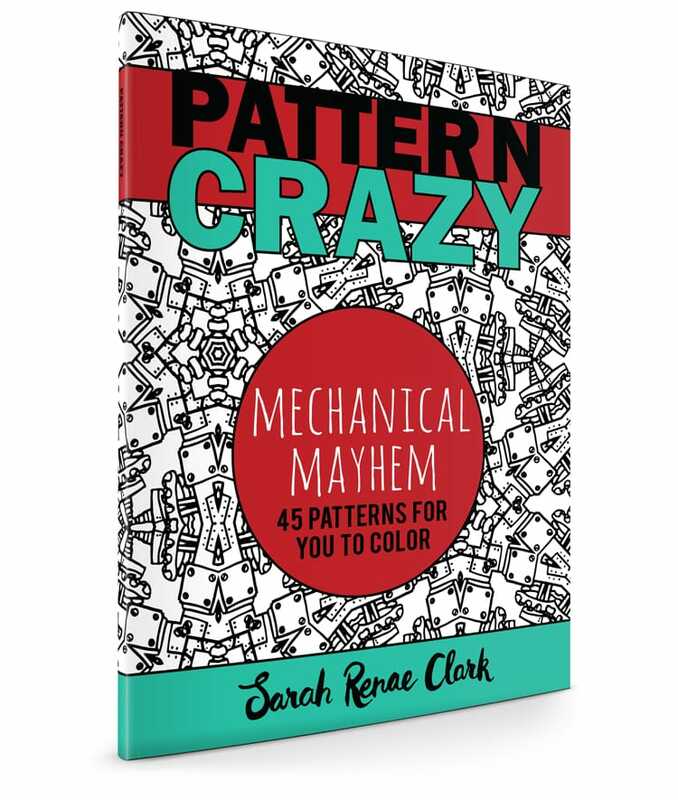 Pattern Crazy: Mechanical Mayhem is the second adult coloring book in this series. The patterns in this book are created from robotic mechanical pen illustrations, with lots of machines, cogs and robotic elements. Recently my husband started to see what this trend of adult coloring is all about. He was printing free download pages off the internet to play around with. So the kids and I have been looking for a good coloring book we could get him for a Father’s Day gift. After I showed the kids a few options this was everyone’s choice. It has such cool and fun patterns that you can fill with all sorts of colors and design. Honestly we couldn’t be happier with this coloring book. The price is so much better than any I found in the stores. I was happy with the size of this book Pattern Crazy: Mechanical Mayhem. In this book there are 45 pages of unique patterned pages to enjoy. Each page is different and filled with possibilities. This is a great coloring book for men, women or anyone one of any age. It’s neat to see all the fun designs and color patterns that come to life. I’m very happy with this book and it definitely made the perfect gift. I’d buy another as a gift in a heartbeat. With a steampunk feel and a good collection of intricate patterns, Sarah Renae Clark presents the coloring world with a book they’re sure to enjoy! The lines are clear and the pictures are inspiring. Thanks, Sarah Clark!